I'm a mom with two boys and they LOVED playing with cars. We even bought them a carpet that was made of roads so they could play with their cars right on the floor of their room. They now make a car bed with lights! My boys would have loved this! Talk about making it easy to put them to bed at night! That was a nightmare, they NEVER wanted to go to bed. This would have made it so much easier! What I love about these is that they have working headlights, some even have lights underneath. Just like the real thing! I'm so excited about these. I've pinned them and showed them to all my girlfriends with boys. The first one will shock the pants off of you because of the price. But really when you buy something like this then you know it won't be cheap. I did find some that wasn't so expensive and still are super cool. 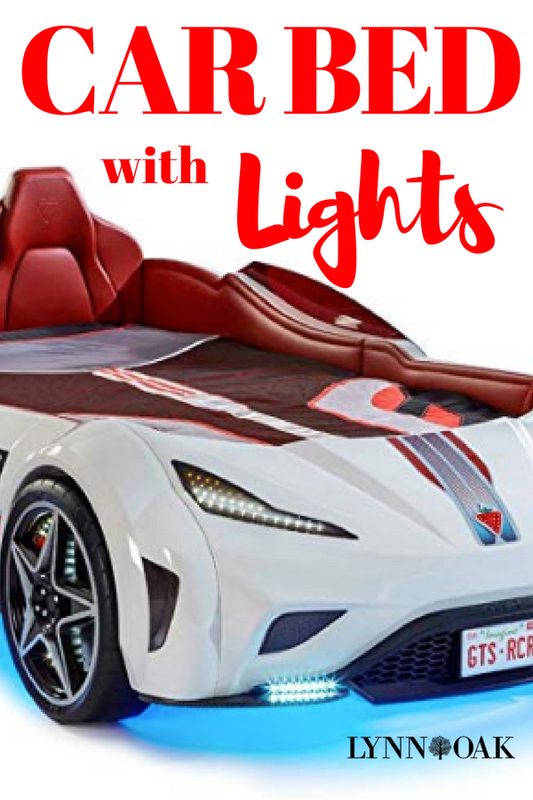 The Awesomest Car Bed With Lights You'll Ever See! I'm freaking out over this thing! It looks AMAZING! So realistic, what kid wouldn't love it. It looks just like a ferrari and has working headlights. The wheels light up too! It has a remote control that makes real race car sounds. I'm so in love with this, you'll be making some boy really happy if you get this for their room. I thought that last bed was amazing, but wait...there's more! This one is by far the coolest bed ever! It has led lights and animations. It has a strawberry shaped remote control for the sounds. Which are real sounding, engine starting, accelerating, cruising, horn blaring. The lights are so awesome with fog lights, and cool underbody lights as well, so your kid can be super cool! One buyer said he really loved it and so did his kid. lol! He said that it was made of plastic but it was very sturdy and nicely made. The seats he said were so like leather and there was a lot of details to make it more realistic. This one would be a favorite of any kid that loves racing! Now this one would be a perfect for a toddler, not as fancy as the others but this one is more for first timers in a Real Bed. It has tap on headlights. The tips I read from the reviews were that you should look at what mattress to get for the age of the child. A 2 year old should have a toddler mattress, they no worries of falling out, because it's not as thick as normal mattresses. Now if you have an older child then a normal mattress would be just perfect, he won't sink in as much as the thinner mattress. Everyone loved it that I read so far. Wow! This Corvette is HOT! What is great about this one is that a crib mattress can fit into it and later down the road you can add a twin as the get older. Just like the last one we looked at. It's more realistic than the last one with a sportier design. It has the easy tap on headlights that can double as a night light. It has a build int racetrack when the mattress is in place. NOTE: There were only a few people that remarked that there were no pre-drilled holes so you got a real workout when you put it together. But it was made that way so it would fit more secure, otherwise you would have been really flimsy and unstable. But those people still loved their purchase! This one is like the others, but if your child loves Disney Cars movie then this one would be the winner. He can watch the movie in bed and be one of the drivers in the movie too! Same as the others with the lighted headlights, which are run with batteries, so get a charger when you buy it as well, for all those batteries he uses up. you're going to need it! I hope you liked these, didn't pick any girl cars, well because I'm a girl and don't think I would want to be in a car bed, maybe I'll do one for girls later on. :-) Please comment below if you found this helpful or if you have any ideas for beds for boys. Wishing you great success with your bed searching!